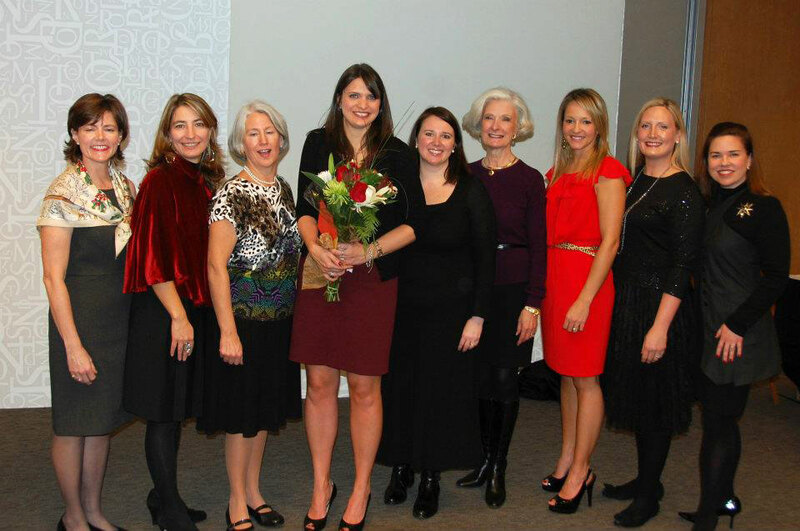 On Tuesday, Sept. 17 the Junior League of Seattle held its first general meeting of the year. With a packed, energetic house, this meeting kicked off the League’s 90th year. Blue Thunder, the entertainment drumline of the Seattle Seahawks, fueled the energy in the room by opening the meeting. In addition to the League members in attendance, several past League presidents and community partners joined us. 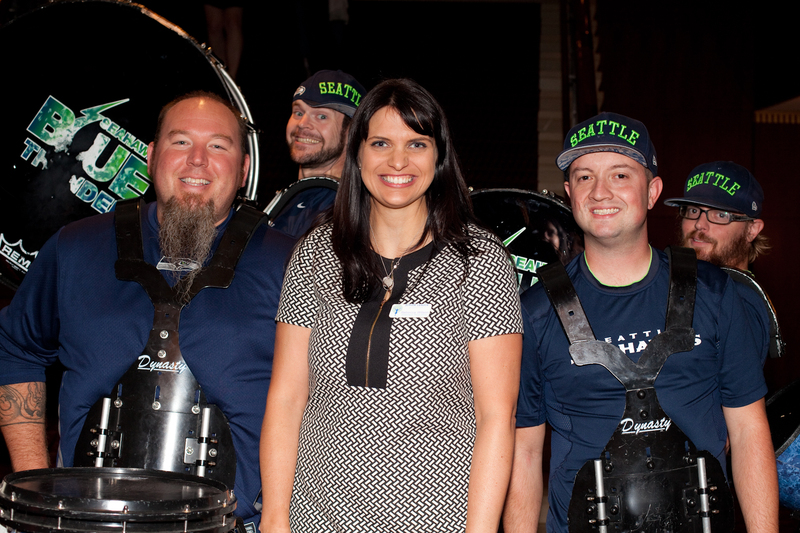 Rebecca Wilson, President of the Junior League of Seattle, with members of the Seahawks Blue Thunder drum line. Our guest speaker for the evening was Dr. Karen Blair, Professor of History and Department Chair at Central Washington University. Dr. Blair focuses on history of Pacific Northwest women and the history of women’s voluntary associations in America. She shared the history and evolution of women’s volunteer groups. With our first general meeting in the books, we have many events to look forward to in the upcoming year. These include our Done in A Day Committee’s goal of completing 90 service shifts by April 5 to celebrate our 90th year. Mark your calendars for the Premier Event, “Lights, Camera, Action!” on Feb. 22 and our May Celebration on May 20 where we will fill a time capsule for our 90th year. There is a lot to be excited about and many ways to give to the community! Junior League members pause for a photo at our first General Meeting of the year. March Unit Meetings take place the week of March 17 through March 22. Unit Meetings are a great way to meet women in the Junior League who live in your local neighborhood, as well as discuss ongoing Junior League of Seattle events, announcements and subject matter in a more intimate setting than a General Meeting. Most meetings are potluck, and it’s a wonderful experience to meet other JLS members outside of your committee and participate in lively discussions. We hope that you’ll make the March Unit Meeting taking place in your neighborhood! Congratulations to President-Elect Nominee, Rebecca Wilson. President-Elect Nominee and Past Presidents: Rhonda Neben, Joanne Petitto, Joanne Jones, Rebecca Wilson, Natalie Bow, Marilyn Leck, Renee Hartnett, Ashley Baerwaldt, Elizabeth Reilly. During a packed General Meeting at Nordstrom’s flagship store on Sunday, December 4, the Junior League of Seattle’s Nominating Committee was thrilled to announce that Rebecca Wilson is our new President Elect Nominee. Rebecca’s experience spans diverse roles within and outside of the Junior League of Seattle. Outside of the League, she has been actively involved in the University Family YMCA, serving on their Board of Directors and leading their annual campaign. She has also served on the Board of the Ruby Room and been involved in Seattle Works. Within the Junior League of Seattle her broad experience has been felt in areas such as Project Development, Lifebooks, and Fundraising Manager. She is currently serving on the Junior League of Seattle on our Board of Directors. Professionally, Rebecca is the Dean of Students at Forest Ridge School for the past five years. She serves on the Diversity Committee and was instrumental in creating a Women in Leadership Speaker series for students and faculty alike. A 2010 graduate of Leadership Tomorrow, Rebecca’s community involvement has and will continue to focus on youth development, education and healthy living. Congratulations Rebecca! We value your leadership and commitment to serving as our leader and helping us all support the Junior League of Seattle mission! December General Meeting at Nordstrom! Please join us at Nordstrom Downtown to celebrate the season as we announce the Junior League of Seattle President-Elect Nominee for 2012-13. Holiday desserts and cocktails will be served and Santa will be available for photos until 5:00 pm! Please remember to RSVP to the Nordstrom concierge to meet Santa at 206.628.1690 by December 1. Guests and children are welcome to attend. Calling all wine lovers! The Premier Event Wall of Wine Committee would love your help. Please bring a bottle of wine valued $25 or above to the December General Meeting at Nordstrom and you’ll be entered to win a fabulous prize! You’ll receive a raffle ticket for every bottle you bring so the more the merrier. If you have any wine connections (maybe through your favorite wine store, winery or a wine club that you might be a part of) please remember that wine experiences are always a wonderful auction item. We thank you in advance for your help in making this year’s Premier Event a success!